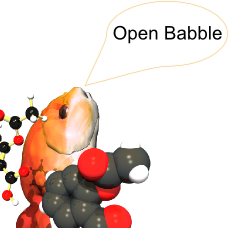 Pre-registration is now open for the 2nd Open Babble, a hands-on Open Babel workshop presented by Open Babel developers. This will take place on July 5-6 2011 at the Unilever Centre in the Dept of Chemistry, University of Cambridge, UK. The workshop will start on the afternoon of the 5th July, and finish on the evening of the 6th. The precise topics to be covered will depend on the attendees’ interests but we anticipate covering topics such as how to get the most from the Open Babel command line applications and the GUI, to writing Python scripts and developing software based on the Open Babel library. Since only 20 places are available, we are running a pre-registration process to select a diverse range of attendees, from novices to expert users, and from both academia and industry. The registration fee will be €70 for academics, and €220 for industry attendees. This includes one lunch and dinner, but does not include accommodation. We also note that sponsorship opportunities are available. 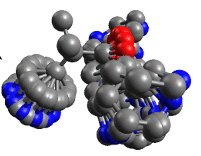 My paper on Confab has just been published by the Journal of Cheminformatics. Confab is a systematic (and exhaustive) conformation generator that uses a torsion-driving approach to generate all diverse (by RMSD) low-energy conformers. Confab - Systematic generation of diverse low-energy conformers NM O'Boyle, T Vandermeersch, CJ Flynn, AR Maguire, GR Hutchison. Journal of Cheminformatics 2011, 3:8. The software itself is available from http://confab.googlecode.com. Many computational chemistry analyses require the generation of conformers, either on-the-fly, or in advance. We present Confab, an open source command-line application for the systematic generation of low-energy conformers according to a diversity criterion. Confab generates conformations using the 'torsion driving approach' which involves iterating systematically through a set of allowed torsion angles for each rotatable bond. Energy is assessed using the MMFF94 forcefield. Diversity is measured using the heavy-atom root-mean-square deviation (RMSD) relative to conformers already stored. We investigated the recovery of crystal structures for a dataset of 1000 ligands from the Protein Data Bank with fewer than 1 million conformations. Confab can recover 97% of the molecules to within 1.5 A at a diversity level of 1.5 A and an energy cutoff of 50 kcal/mol. Confab is available from http://confab.googlecode.com. I've written about using the Kinect to control Jmol, but there's another game console gadget that's been around for some time that offers similar possibilites - the Wii Remote or more simply, the "Wiimote". We are pleased to announce that it is now possible to carry out the Wiimote possibilities into Avogadro. The Wiimote gives the opportunity to use a cheap, easy and flexible device for educational purposes for example. By pointing a Wiimote at a screen you can create, rotate, substitute atom by fragment, ... molecules. Also, you can use it with projector. Anaglyph (Red-Cyan)/3D possibilities have been implemented. The feeback (rumble functionality) can be used to check « on the fly » proximities between the molecular system and the manipulated atom. It would be nice to finally see one of the open source 3D viewers come with this functionality out of the box, so this is a very exciting development. For more information or if you want to get involved, see the Avogadro mailing list, the github repo, or the website for the project (English/French). The image above says it all. 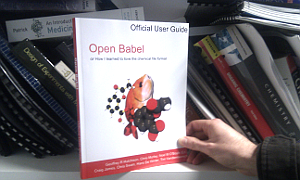 We've packaged up the Open Babel user documentation as a 160-page book and it's now available for purchase from Lulu at the cost price of €7.48 (since the postage may cost almost as much, you may want to consider buying Egon's and Angel's books at the same time). 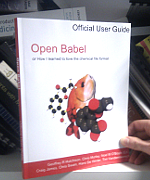 This is the same documentation available from http://openbabel.org, but we've made it into a quarto-sized book (roughly the same aspect ratio as Letter, but somewhat smaller) with a glossy paperback cover. I'm very happy with how it's come out (apart from some minor things) - thanks to LaTeX it looks pretty professional. It'll be interesting to see how many copies of this are sold, seeing as we are giving the content away for free electronically. Personally I find it much more convenient to have a book than to print out a PDF. And I should point out that we welcome further contributions to the documentation, so if you want to see your name up there in lights...I mean...on the front of a book, start sending in your chapters now! Technical notes: The LaTeX for the PDF was generated from reStructuredText using a development version of Sphinx 1.1 so that URLs would be included as footnotes. The source is stored in a Mercurial repository at BitBucket. Feel free to fork to fix typos! The project involves parallelisation of the forcefield code, and potentially porting it to the GPU using OpenCL. There is a lot of expertise at ICHEC in these areas. If you know someone in chemistry, physics, or computer science (from any country) who might be interested, I'd appreciate if you could point them to this blog post or the ICHEC website. The closing date for application is 13th March. The final step is to get hacking on Jmol itself. We need to add support for reading hand locations from the OSC port, and then to spin or rotate the molecule based on the x, y, z coordinates of the hands. (1) Follow the instructions on the Jmol wiki to install Eclipse, checkout the Jmol code from subversion, and compile it. (3) These Jmol.java files have an additional dependency on JavaOSC. You can find the jar in the lib directory of the javaosc.zip available here. To add the jar file to your CLASSPATH in eclipse, right-click on Jmol, Properties, Run/Debug Settings, Jmol, Edit, Classpath, Jmol, Add External JARS, and navigate to the Jar file (oh Eclipse, how we love you). (4) Run Jmol from inside Eclipse, max out the screen, and wave your arms around. And so there you go...hopefully this will get other people interested in hacking some Kinect into chemistry software. Only this last post was Jmol-specific; the general idea could be used to control any software.